아마존에서 7월 16/17일에 프라임데이를 진행했다. 프라임 회원만을 대상으로 실시한 행사로 물건 가격을 확 낮추거나 기프트카드 구입 시 혜택을 주었는데, 아마존에서 치고 나가니 다른 쇼핑몰에서도 그냥 있을 수 없나보다. 이베이, 뉴에그, 라쿠텐, 베스트바이 등 유명한 쇼핑몰은 다 같이 프라임데이에 견제구를 날렸다. 이베이는 119달러 이상 구매시 25달러 할인 행사를 했다. 모든 상품 대상이며, 장바구니에 119달러 이상 담고 쿠폰코드 ‘PRIMO119’를 입력하면 25달러가 할인된다. 라쿠텐은 앞에서 쓴 모든 구매에 대해 20%(최대 30%) 포인트 적립행사를 하루, 그 다음날은 모든 구매상품에 대해 20% 할인행사를 했다. 적립은 모든 구매에 대해 자동으로 적용되었으며, 20% 할인은 장바구니에서 ‘SAVE20’이란 코드를 넣으면 적용됐다. 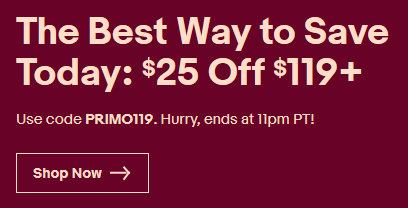 *20% Off Sitewide Coupon: 20% discount up to $50 maximum discount valid from 7/16/18 at 12:00AM (PST) until 7/17/18 at 11:59PM (PST) or until promotional funding is exhausted, whichever occurs first. Rakuten.com reserves the right to cancel, modify or limit the promotion at any time in its sole discretion. This promotion is open only to individuals 18 or older and must establish a Rakuten.com account or be signed into their Rakuten.com account to apply the Coupon Code SAVE20. Only one coupon can be used per account within a single transaction with one merchant, while supplies last. Coupons cannot be stacked together. Limit one redemption for each coupon per household. Coupon code exclude certain products due to the merchant’s sales restriction. Gift cards cannot be redeemed in conjunction with this promotion. Bulk purchases made by re-sellers do not qualify. This promotion is not valid with any other offer. You are responsible to pay for any applicable sales tax on your purchase and this is valid in U.S. only. 뉴에그는 일부 품목에 대해 추가 할인 등의 행사를 했다.